Your little wild ones are your pride and joy. 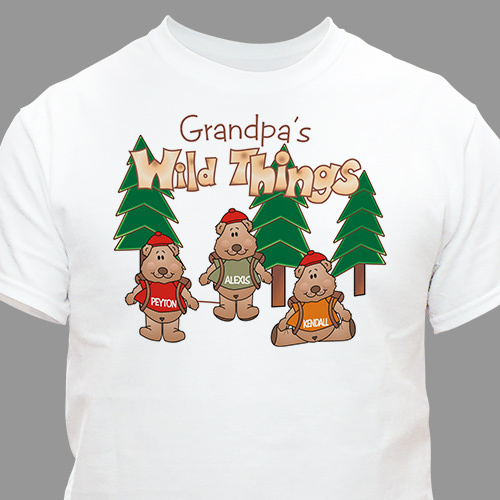 Let Grandpa or Dad show off their kids and grandkids with our Wild Things Personalized T-Shirt. Personalized Shirts are available on our premium, preshrunk 100% cotton Grandpa Shirts, machine washable in adult sizes S-3XL. FREE personalization includes any title like Grandpa, Dad, Papa, you choose and up to 30 children's names each printed on their own Teddy Bear. Good quality shirt, and have had many compliments on it. Additional Details Personalized Shirt for Grandpa make an excellent Father's Day Gift ideas! Change your personalized shirt to include any title like for an Uncle or Aunt. These personalized shirts make unique gifts for him or her on Christmas, Birthdays or any special occasion.